I don't think I have shared this card. A simple design really, using up some scraps of paper and some simple stamping. The die cut border is made with this MFT die. I love how they cut a 6" border - easy to use on cards! Super flot CAS kort... lækkert stempel og så fint med det røde hjerte. 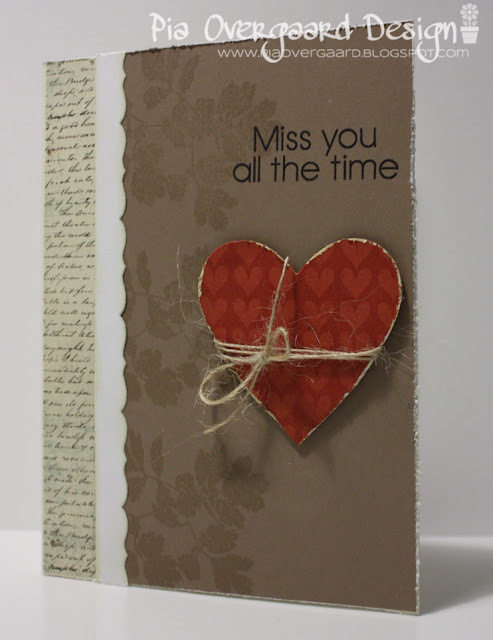 I love this pretty card, especially the way you roughed up the heart and added twine. Thanks for the inspiration. this is so pretty, Pia! love the stamping and distressed details! So pretty! I love the twine on the heart. Perfect! Wauw... det er bare super flot, og igen har du lige tryllet lidt med en "stump twine". Love love love this card, one of my favorite layouts and i love how you wrapped the twine around the heart!